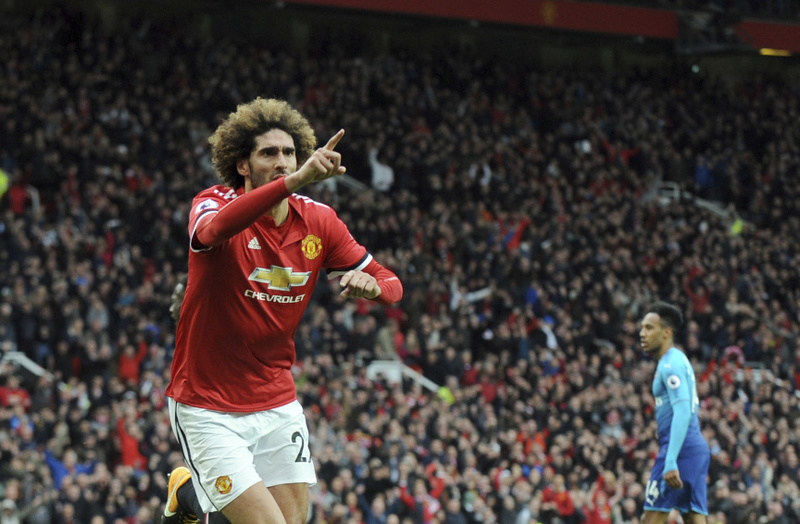 MANCHESTER, England (AP) — Arsene Wenger endured more agony at Old Trafford as his depleted Arsenal side conceded an injury-time goal by Marouane Fellaini to lose 2-1 to Manchester United in the Premier League on Sunday. This was nothing like the 8-2 loss in 2011 or the 6-1 defeat here in 2001, but it was painful nevertheless for Wenger on a day he was honored with a glass vase before kickoff by former United manager Alex Ferguson and embraced by the current one, long-time foe Jose Mourinho. Henrikh Mkhitaryan marked his return to Old Trafford with an equalizing goal as Arsenal — fielding a largely second-string team in view of the Europa League semifinal second leg on Thursday — responded well to conceding a 16th-minute goal from Paul Pogba. This was once one of the must-see fixtures in English soccer, but the recent decline of Arsenal meant this edition lacked the bite and intensity of some of the past meetings of the two teams. Even United fans' welcoming of Wenger — they applauded him to and from the dug-out — said much about a game that meant little to Arsenal and felt like a pre-season match at times. Romelu Lukaku crossed to the far post where Sanchez planted his header — via the boot of Hector Bellerin — against the post. The ball rebounded out to Pogba, who sidefooted a volley into an empty net. Arsenal didn't collapse, though. The visitors were given a boost when Lukaku hobbled off in the 49th after being on the receiving end of a kick by Mavropanos, and then equalized. Almost inevitably, it was Mkhitaryan who collected the ball from Granit Xhaka after United lost possession in midfield, advanced as the home defense backed off, and slammed a low shot into the far corner from the edge of the area. Marcus Rashford had a goal ruled out for offside moments before Fellaini glanced Young's cross into the corner.